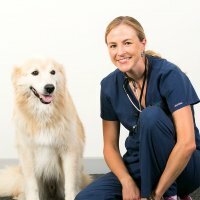 Dr Seymour became a vet because she thought it would be interesting and provide more excitement and challenges than her first degree in Audiology/Speech Pathology. Her veterinary employment began in a small practice in Ipswich for a few months followed by a year-long surgical internship with Bruce Smith. She then worked in a general practice on the Gold Coast for 4 years. In her spare time Dana enjoys time at the gym doing crossfit and when home she relaxes by reading novels. Her pets include “Tonka (a Staffy x Kelpie), “Poppy” (a Border Collie x who was adopted after a drug study from the University of Queensland while Dana was still in vet school). Then there’s “Jamu” (a Golden Retriever x Maremma who is extremely storm phobic and has destroyed walls, windows, curtains and carpet on more occasions than Dana cares to remember). “Aussie (a Ragdoll), “Ninja” (a DSH adopted as a stray while working in general practice), and “Mouse” (a DMH adopted from the RSPCA after being rescued from a storm water drain).